The Idaho flag hangs in the Statehouse. 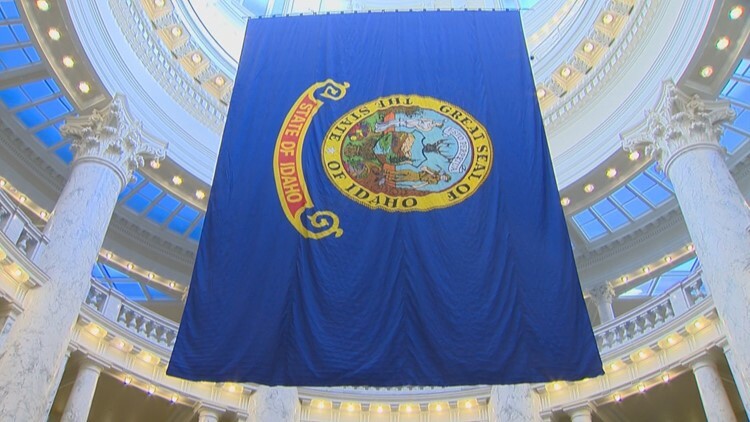 BOISE, Idaho — Idaho state lawmakers say they are working on an agreement involving an impasse on legislation that could lead to changing the Idaho Constitution. A resolution introduced last Wednesday proposes an amendment involving redistricting that Republicans want but Democrats oppose. Republican Majority Leader Mike Moyle and Democratic Minority Leader Mat Erpelding say there could be an agreement in place by Tuesday, but didn't elaborate. The redistricting commission meets every ten years, following the latest census, to draw the boundaries for Idaho's 35 legislative and two congressional districts. Right now, the commission has six members, with Republican and Democratic officials each selecting three. Democrats say the proposed amendment is an attempt at gerrymandering that's being rushed through.